Xtreme Cyclone provides insight into what to expect for the 2013 cyclone season. Redlands, California—Esri announces that Wall Street Network (WSN) has released the first of a dozen risk management solutions, based on ArcGIS Online, called XtremeGIS. 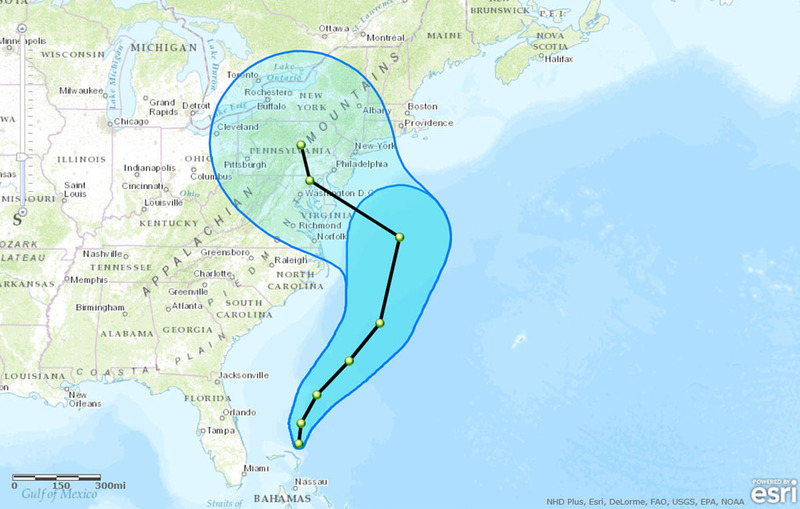 XtremeGIS provides access to information including global tropical cyclone event and forecast data from AccuWeather, satellite imagery from i-cubed, and WSN's knowledge management software. It can be used to discover and analyze hazards located around assets such as office buildings, retail and manufacturing sites, distribution centers, and the supply chain. "The bottom line is you don't have to be a meteorologist to understand a hazard or a rocket scientist to understand property risk," says Kristina Mazelis, chief operating officer at WSN. "We do the science and analytics assessing risk and provide access to it through ArcGIS Online, giving everyone the opportunity to assess their own risk." "This is a real game changing, disruptive technology," says Simon Thompson, director of commercial industry, Esri. "Currently, when a catastrophic event occurs, everything shuts down. XtremeGIS gives businesses the advantage of insight so they can take control of their own activities and rethink where and how they grow." To learn more about the XtremeGIS solutions, visit www.xtremegis.com. For more information on how the ArcGIS platform helps organizations around the world manage risk, visit esri.com/insurance. About Wall Street Network, Inc.
Wall Street Network, Inc. is an independent software vendor that develops XtremeGIS Risk Management Solutions, award winning enterprise content & knowledge management software WSN Insight and Clearview ECM, and provides professional services. Wall Street Network is a Microsoft Certified Gold Partner, ISV as well as a Microsoft Services Ready Partner.